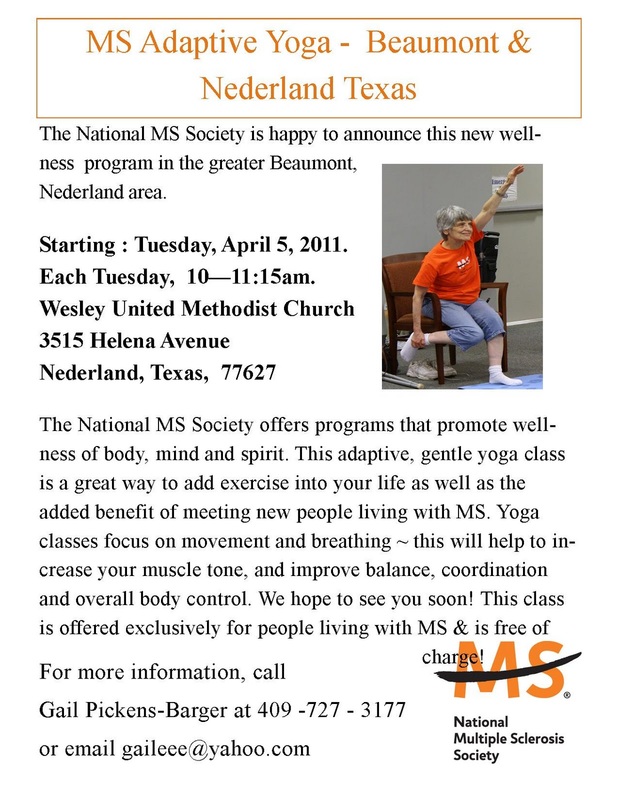 Every Tuesday at 10 a.m. at Wesley United Methodist Church, 3515 Helena Avenue, Nederland Texas, The National MS Society sponsors a free Adaptive Yoga class for those who have MS and their support people. Additionally the MS Adaptive Yoga class is taught every 2nd Saturday at 10:45 a.m. at Beaumont’s Self Help Support Group for MS, held at the Health South Rehab center in Beaumont Texas (unless there is a scheduled speaker). Join Experienced Registered Yoga Teacher, Gail Pickens-Barger for an hour long class. This adaptive, gentle yoga class is a great way to add exercise into your life as well as the added benefit of meeting new people living with MS.
Yoga classes focus on movement and breathing-this will help to increase your muscle tone, and improve balance, coordination and overall body control. We hope to see you soon. This class is offered exclusively for people living with MS and is free of charge. Call Gail Pickens-Barger at 409 – 727 – 3177 or email gaileee@yahoo.com for more information. 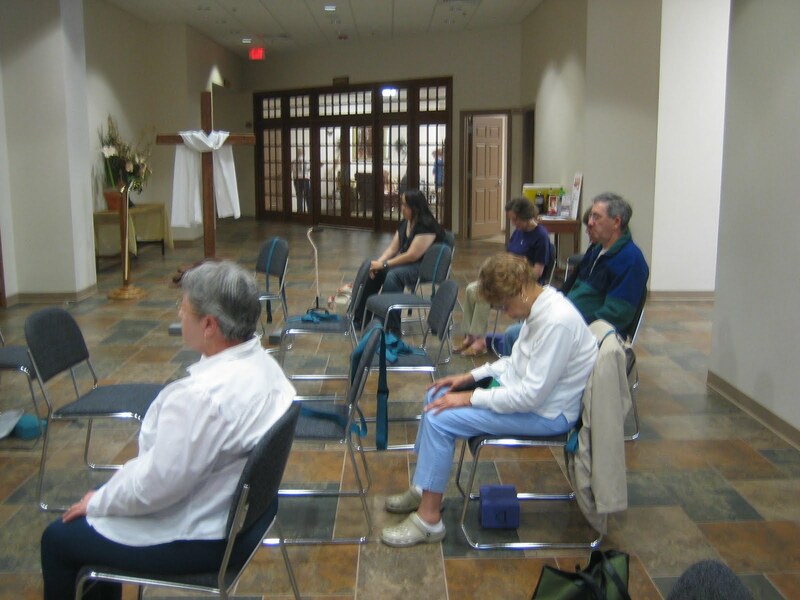 Adaptive Chair Yoga for MS at Wesley United Methodist Church, 3515 Helena Avenue, Nederland, Texas 77627. Sponsored by the National MS Society, free for attendees and their support people. 10 a.m. to 11:15 a.m.
Additionally the Adaptive Chair Yoga class is taught every 2nd Saturday at 10:45 a.m. at Beaumont’s Self Help Support Group for MS, held at the Health South Rehab center in Beaumont Texas (unless there is a scheduled speaker). 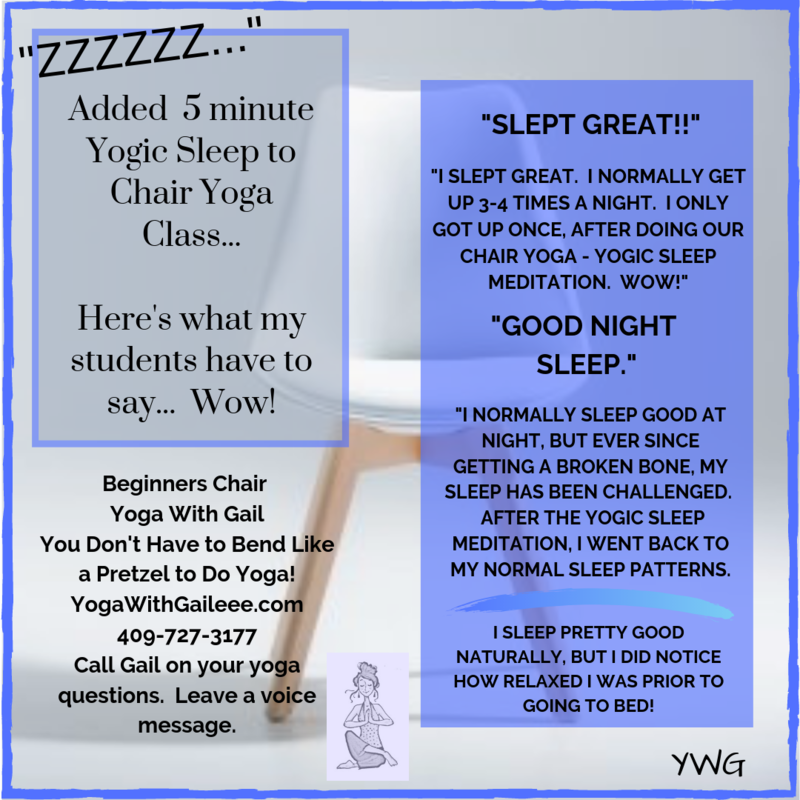 Instructor Gail Pickens-Barger is a member of the International Association of Yoga Therapists and the Yoga Alliance, and is sponsored by the National Multiple Sclerosis Society. in Adaptive Yoga for Multiple Sclerosis. For more information, contact Gail Pickens-Barger at 409-727-3177 or gaileee@yahoo.com . Posted on June 11, 2011 by yogawithgaileee. This entry was posted in Uncategorized. Bookmark the permalink.